Emotion and grief changes and alters all of us- we all handle difficult situations differently. This book brought out so much of my own emotion and made me realise exactly what matters in life the people who mean the most my family and friends. Summary: Ethan Wate is in love with a Caster Girl. When he looks at Lena, It's like there's no one else in the world. But Ethan is mortal, and on her seventeenth birthday Lena made a choice that changed everything. Now, if they are to fix the chaos Lena has caused, one of them must make a terrible sacrifice. Sometimes there isn't just one answer. Sometimes there's no going back. And this time there won't be a happy ending. 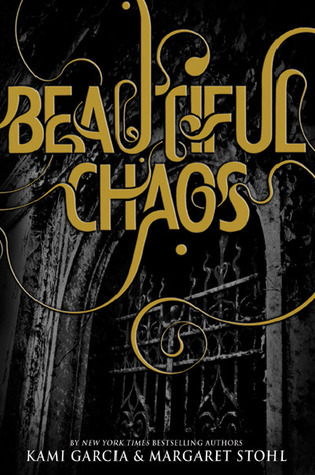 Review: Beautiful Chaos is the third chapter in the series. The love between Ethan and Lena is still the same. In reading this novel it's like I'd never left it and I'm just as hooked on the characters and the plot. Lena and Ethan have had to overcome so many twists and turns so as a reader you're on edge for anything to happen. Ethan tries so hard to remain positive and confident that they can get through anything. But does he really believe that? I'm not sure I like the new Link maybe he'll grow on me ha. Woah! This novel has more twists and turns than the first two put together, each page has you on edge wondering what will happen next. 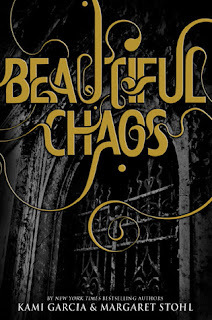 Beautiful Chaos ties up so many un-answered questions especially regarding Sarafine. When Lena learns more about why her mother is the way she is, you are genuinely saddened and emotional. This novel is about love, friendship and sacrificing all you have for the people that matter. Many of the characters in this book are truly selfless for the people they love. There are a few characters who will surprise you with the way they act. Gah! I have to read book 1 of this series soon I keep seeing awesome reviews on this one!